Star Trek depicts a balanced human society where technology is mainly used to enhance their quality of life. The opposite is true in a large portion of the sci-fi universe known as dystopian futures. The evolution toward excessive “optimization” of societies that dominate every aspect of human life, sentient technology or rapid advances in non-sentient technology may lead to radical changes in the social order, dehumanization, totalitarian governments, environmental disaster or other cataclysmic events. A dystopia is a community or society that is in some fundamental way undesirable or frightening. In order to continue to be human and not a robot, the individual needs to preserve certain degree of unattached intricacy essential to his different biosocial rank. Loss of our emotional depth, independent thought and power to choose freely will lead to the destruction of our humanity. Lower standards of living, or pleasure-packed but emotionally barren lives will result (“Lots of love-making, but no love”). At the top of this list one have to place the truly original, shocking, visceral, chaotic, modern-primitive and utterly unpredictable score of Planet of the Apes (1967). Composed by the genial chameleon Jerry Goldsmith, it is full of thunderous odd percussion, piercing strings, and animal-like sounds. It constitutes a true landmark and a turning point in movie score history. “I’ve seen things you people wouldn’t believe. [laughs] Attack ships on fire off the shoulder of Orion. I watched c-beams glitter in the dark near the Tannhäuser Gate. All those moments will be lost in time, like [coughs] tears in rain. Time to die.” (speech improvised by Rutger Hauer, the actor who plays the replicant Roy Batty). The ultimate “cyberpunk” cult film Blade Runner (1982) has one of the most evocative, haunting, and thought-provoking scores. 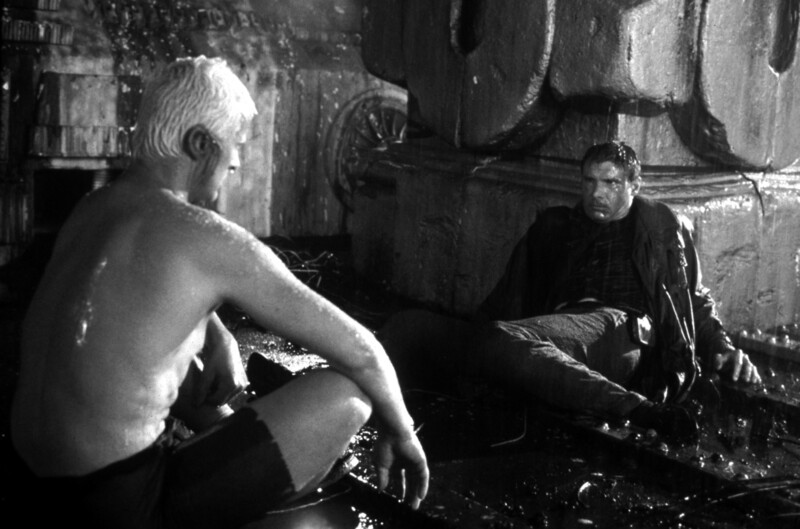 “Tears in Rain”, the last track of the official score for the film by Vangelis, will always be an integral part of “the most moving death soliloquy in cinematic history” (The Philosopher at the End of the Universe). Unfortunately, due to creative disputes, the true Vangelis score has never been released. All the different commercially available incarnations are “replicant” scores. There is no written score of the music, and trying to reversed engineer the music has proven to be a haunting task, given the improvisational nature of the score and the use of vintage electronic technology and synthesizers. The eerie and bizarre Brad Fiedel’s score is as much a character of the Terminator 2 (1991) as the shape-shifting mimetic polyalloy T-1000. Nightmarish, strangely intense and very thrilling, the minimalist score composed by Don Davis is definitely a big contributor to the excitement of The Matrix (1999). The groundbreaking and exhilarating scores of these films catapult them to otherwise unachievable cinematic heights. These compositions recall Igor Stravinsky’s “The Rite of Spring” and Bela Bartok’s “Music for Strings, Percussion and Celesta”. Devoid of recognizable melodies and classical-like orchestration, these dystopian scores stand opposite to Romantic-like scores like Star Wars (John Williams) and Star Trek (Jerry Goldsmith). The astronaut Taylor, the replicant Roy Batty, the living tissue over a metal endoskeleton Terminator, and the captain of the Nebuchadnezzar should all be proud of the incredible body of musical work created for their dystopian futures.